The coolest football play I have seen in a long time happened over the weekend. 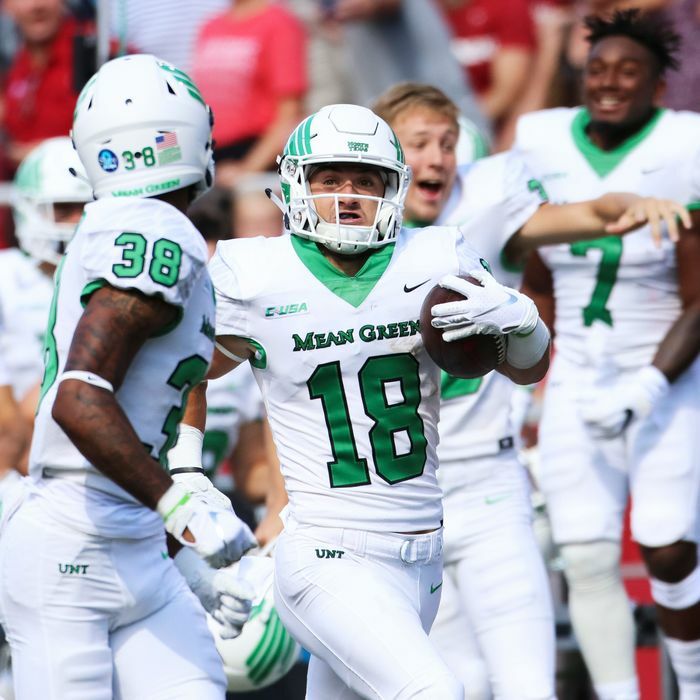 Keegan Brewer, a punt returner for North Texas, a heavy underdog playing on the road against the SEC’s Arkansas Razorbacks, went back to receive a kick, with instructions for a kamikaze mission that seem more out of theater class than football practice. The kick went up in the air and then … well, just watch it. If you were wondering why none of those Arkansas players went full hog and waylaid that poor defenseless player while he was just helplessly standing there, that’s because he, and the North Texas coaching staff, tricked them. The play, which, as explained in a fantastic piece by SBNation’s Alex Kirshner, was months in the making, requires the entire North Texas team, both on the field and off, to pretend that Brewer had called for a fair catch, either by stopping blocking or looking aimlessly away from the field, as if the play were over. If Brewer had called for a fair catch, no Arkansas player could touch him, so everyone pretended like he had, and the Razorbacks players thus assumed he had. Brewer then waited until anyone who could tackle him was walking away … and then sprinted all the way down the field for a touchdown. In a copycat sport involving dozens of coaches watching hundreds of hours of film every week, thus leading to every conceivable new strategy feeling chewed through and discarded within days of being introduced, the fake fair catch play felt ingenious and exciting, a clever bit of deception invented out of necessity by a heavy underdog, a plucky David taking down the self-satisfied Goliath. (And North Texas did end up winning the game.) If you saw such a play in a sports movie, you’d cheer the shrewd resourcefulness of the good guys pulling one over on the bad guys. The play remains, three days later, hypnotic to watch. It makes you want to cheer. Except … well … the whole point of the fair catch is to protect defenseless punt returners who, otherwise, would be sitting ducks for a huge dude sprinting directly toward them to flatten them. Want to see what happens if you don’t have a fair catch rule? There is no player in all of organized sports more defenseless than a punt returner who is looking up at the sky, waiting to catch the ball, while 11 men bear down on him at full speed. It is the equivalent of walking across the Autobahn blindfolded with your ankles tied together. Even if you think football is “too soft” like some people, you can’t argue against the fair catch rule. Players would break their necks every week without it. So, then, it seems particularly odd, and maybe a little disturbing, at this particular moment in football history, that a coach would exploit a rule meant to keep players safe in order to benefit his team, no? What North Texas’s special teams coordinator Marty Biagi asked Brewer to do, essentially, was stand there and wait to be destroyed … and, fingers crossed, he wouldn’t be! Even Biagi understood what he was requiring of Brewer: “You can’t just put that in on a Wednesday and then go, ‘Hey! Trust me!’” he said. It is to the credit of Biagi and Brewer, as well as the rest of their North Texas brethren, that the play was so well constructed and well executed that Brewer wasn’t obliterated right there on the Fayetteville grass. But the very fact that Brewer, who, I feel obliged to point out, is a college sophomore who isn’t even getting paid for any of this, was asked to stand there helpless and naked and this close to having his head ripped off for our amusement, and surely felt that saying no was never an option to him … that’s a little weird to celebrate, right? Sure, it’s funny and clever that North Texas got away with something. But what if they hadn’t? What if an Arkansas player realized that Brewer hadn’t called for a fair catch and just flat laid him out? How funny and clever is it then? But it is probably also worth considering that Brewer wasn’t laid flat, wasn’t absolutely destroyed by a rampaging tackler. And that is, in part, because of how football has changed over the last decade, making remorseless hits of defenseless players much, much less common than they used to be. There have been rule changes, but those changes have also cascaded through the way the game is played — they have made players more safety-conscious, as weird as that is to say about football, more deferential to opponents in positions of physical vulnerability. Which is exactly why the play design was so brilliant. What Biagi recognized was that, even if Brewer really was a sitting duck, the defender almost certainly wasn’t just going to go all-out and destroy him, because defenders are discouraged from those sort of big hits, penalized for violent-looking hits even if they are in fact legal, because of the increasing focus on the brutality of the sport. When defenders see opponents standing like sitting ducks, they don’t drool anymore, they ease up, suspicious, looking at the guy with the ball like a kid with a cookie that’s a little too available … a kid who smells a trap. Ten years ago, Brewer might have gotten leveled anyway, fair catch signal or not, out of defensive instinct. Now, the instinct is in the other direction. Now everybody plays it a little bit safer, just in case. In a weird way, this doesn’t feel like a one-off, but a new front in football’s evolution — the next logical phase of the sport’s increasingly quixotic, almost certainly impossible, quest to make itself safer. That is, that coaches try to game the protections. This is an obscenely competitive endeavor run by freakishly obsessive people, who have near-absolute power over their charges, desperate for every possible edge they can give themselves over their opponent. Make a rule that attempts to curtail the natural violence of the sport? They’ll use it as a loophole, over and over, until you either close the loophole, thus making the game more dangerous again, or you keep it open and make the game itself less enjoyable to watch. Knowing what you know about football people: Where do you think it’s more likely they’ll land? Attempting to make football safer is a fool’s errand not just because the game itself is dangerous, but also because the men who run it don’t think in terms of “safe” or “unsafe.” As we see at Maryland and countless other football institutions, they only think about winning. If it requires you walking through traffic blind and helpless, dammit, that’s what it takes.